Temperature variability in Winnipeg, Canada, was assessed by determining average and extreme temperature ranges over 1, 2, 5, 10, and 15-day intervals, on a monthly basis, for the period of 1872–1993. Trends in the monthly averages for each of the intervals were also examined. The results show that Winnipeg experiences a very large amount of short-term temperature variability, especially over 2, 5, 10 and 15 days. The monthly average diurnal ranges vary from about 9 to 14 °C, while the 15-day average ranges are about two to three times as large. In general, average temperature ranges over the two shortest intervals (1 and 2 days) are slightly greater in the warm-season months than in the cold-season months, but the averages for the three longest intervals are inversely related to mean monthly temperature, as are the largest ranges observed in each of the months. Average temperature variability in the months of November through March was found to have decreased quite significantly, and rapidly, during the first two decades of this century. This decrease was likely associated with a decrease in the meridionality of the atmospheric circulation. It also occurred during a time when the average maximum and minimum temperatures in Winnipeg were rising, lending support to the conjecture that a warmer global climate will result in less 1–15 day temperature variability. 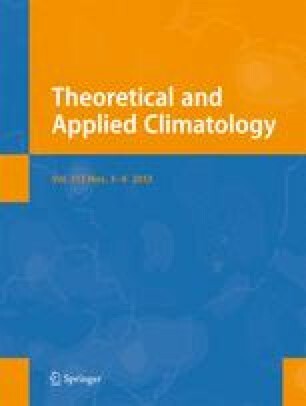 The rapidity of the change also supports the hypothesis that climate changes tend to be non-linear.